Steel Art Studio Specializes on all types of Balustrade from stainless steel and mild steel to glass and frameless glass balustrade and for a extra special touch we can even add some wood to your design, Steel Art Studio will design, manufacture, deliver and install your balustrade for you according to your needs, specifications and requirements. WEEDOO balustrade systems are available in glass and aluminium, and offer an elegant, cost effective solution to your balustrading requirements. 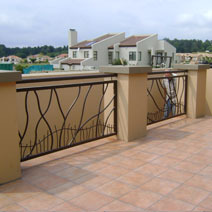 Stainless Steel Balustrades, Glass Balustrades, Frameless Glass Balustrades, Johannesburg, Balustrades, Handrails, Footrails. Design Stainless Products South Africa, offers you the strongest, safest, most affordable, easiest, Stainless Steel Balustrade kit system on the market. , WEEDOO-SA offers a range of innovative, stylish, low maintenance and energy efficient products to enhance the appearance of any home or building.